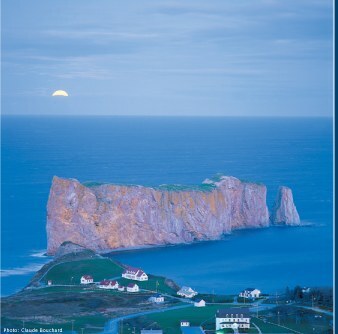 Gaspésie, synonymous with open space, air and liberty, is renowned for its matchless adventure tourism opportunities thanks to its wilderness, coasts and majestic sea. It has been famed for a very long time for the beauty of its commanding natural landscapes, which attract visitors from all over the world. At first, Gaspésie was highly prized by the gentry for its salmon fishing opportunities and the sheer size of its vacation resort areas. Then, it was quickly elevated to first place among Quebec tourist destinations. This territory covers approximately 244 km_, of which many features still call for discovery. It is wrapped in an exceptional microclimate, much appreciated by both trail and beach hikers. The land hugs the sea, and, from this union, pebble beaches, small coves, breathtakingly high cliffs, rocky capes and promontories, as well as fine sand beaches were born.